We used to a have a tuck shop at school that sold sausage rolls, pens and pencils etc. The term "tuck", meaning food, is slang and probably originates from such phrases as "to tuck into a meal". It is also closely related to the Australian English word "tucker", also meaning food. "Tucker" may originate with the lacework at the top of Nineteenth Century women's dresses, but the origin of its use in regard to food probably arises from the popular shops run in England by various members of the Tuck family between at least 1780 and 1850. The earliest reference found is to one Thomas Tuck whose famous "Tuck's Coffee House" in the university city of Norwich in Norfolk UK attracted many academics. A tuck shop was originally a pastry shop selling pastries and sweets to schoolchildren. The Oxford English Dictionary says the verb tuck (often tuck in or tuck into) meaning "to eat heartily or greedily" is from 1810. The simpler sense "to consume or swallow food or drink" is from 1784, and means to ‘put away’, ‘put out of sight’. 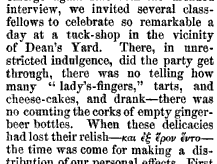 Their earliest citation for tuck shop (and tuck as food) is 1857, but I found some earlier examples. We passed our time on the two days allowed us in as pleasant a manner as possible ; we had some good games in the field attached to the school, and took great care to spend every farthing of our cash in the "tuck shop," and doubtless were not overglad when we were collected together by one of the beadles and introduced into the grammar-school to have our "divisions" assign us, or to hear which school we were to attend in the afternoon or morning. ... we invited several class-fellows to celebrate so remarkable a day at a tuck-shop in the vicinity of Dean's Yard. There, in unrestricted indulgence, did the party get through, there was no telling how many "lady's fingers" tarts, and cheese cakes, and drank - there was no counting the corks of empty ginger beer bottles. Yes, there it stands, and as brightly as ever shines the name of over the door. The "tuck-shop," the baker's next door to the playground, the place where at twelve o'clock dozens of hot ginger-cakes, queen-cakes, and buns were devoured by boys whose dinner-hour was one. 6. a. slang. Usually tuck-out (also tuck-in): A hearty meal; esp. in school use, a feast of delicacies, a ‘blow-out’. b. Food, eatables; esp. delicacies, as sweet-stuff, pastry, jam, etc. (School slang). Cf. tucker n.1 6.
but it doesn't explain the derivation of meanings. Sure-fire: where does it come from? Where does the suffix “-tine” come from?